This has been an amazingly wet winter-- but where has it been most unusual? 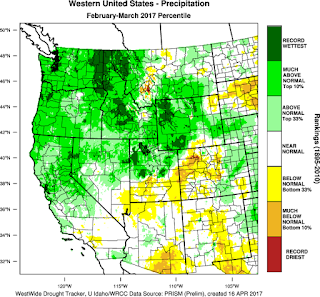 To gain insights into this important question, here is an analysis from the Western Regional Climate Center (WRCC) showing the percent of normal for October 2016-March 2017 precipitation over the western U.S. The darkest greens indicate the wettest on record. A huge region region stretching from northern CA through northern Nevada, into Idaho, Wyoming, Montana and eastern WA. 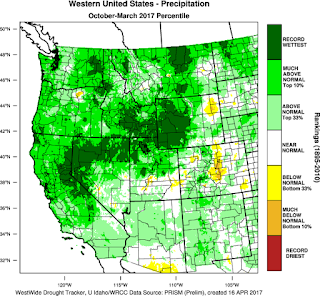 Nearly the entire Northwest U.S. was in top 10% wet season. 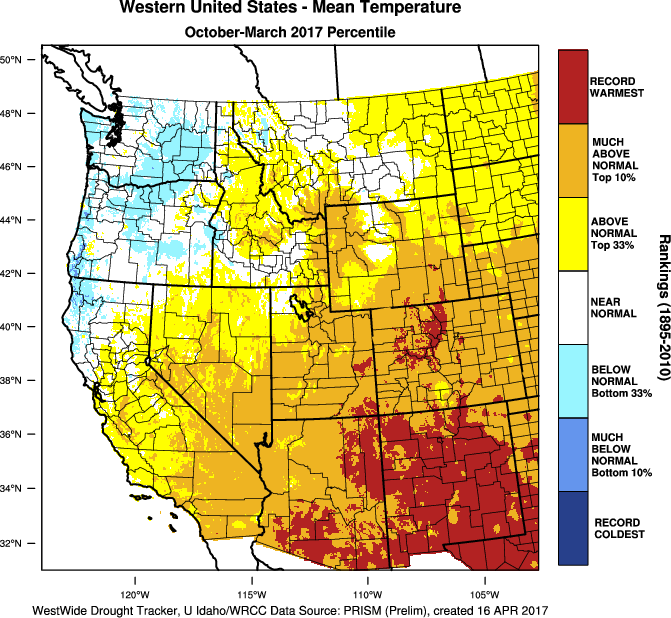 The April version will add parts of western WA. The late winter (Feb-March) maps shows how wet conditions were particularly unusual in the northern Rockies. Eastern Washington, Idaho, and western Montana had unprecedented large amounts of precipitation. Mean temperatures from October through March? Cooler than normal over Washington and Oregon....no big surprise. This week, a colleague at the US Army Corps of Engineers told me that the soils of our region are extraordinarily saturated....and that he was worried about spring flooding. 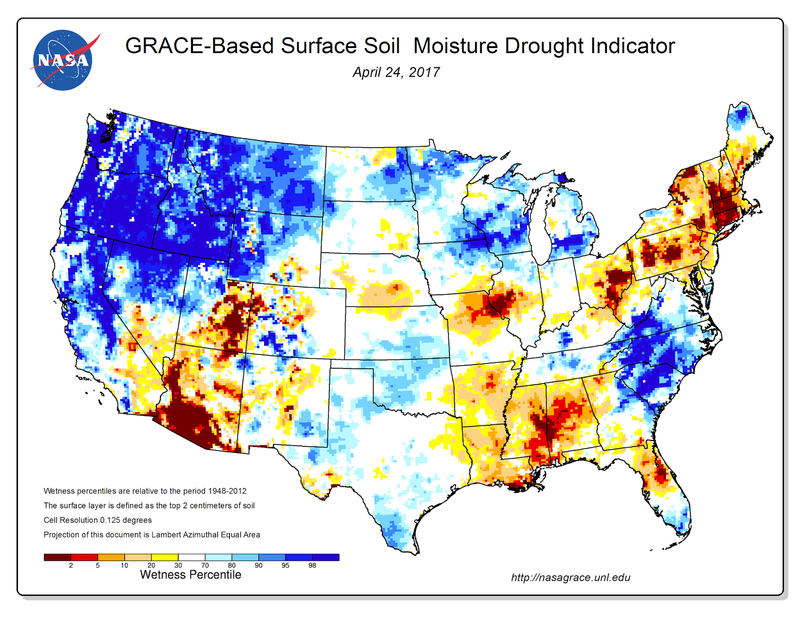 Well, here is the latest soil moisture observations based on the GRACE satellite (measures moisture using its effects of gravity). The entire Northwest is WAY wetter than normal (darker blue colors). A front is now approaching our region and there will be rain later this afternoon, tonight and early Sunday morning (see forecast precipitation for the 3 hr ending 8 PM tonight). So get out now. Better to have rain, clean air than dry conditions, fire and bad air pollution. Having lived through 200-400 AQI(Seattle is usually around 25 or less) air pollution days at a time, I'll never complain about rain again. Two quick comments. The Bureau of Reclamation gives daily statistics on the combined 5 reservoirs of the Yakima Irrigation District, and for the water year they're running 109% of normal precip. Matches well with your map. By why did the central Cascades, and near the crest of the Cascades, run a disparity (relatively speaking) as oppose to both E & W lower slopes and interior valleys. I find that interesting. And I cannot believe we in Washington, particularly Eastern Washington, suffered only a little cooler winter. This was incredible cold. Every old timer said so. I nerd out on weather and remember every year, and I can say this was our coldest winter of the 21st century. Probably not past a few in the 90s or 80s. I think the residual warmth of October and November skewed those figures. So if it's been so cold and wet why is it that snowpack is only around 100%?? Yes! @Dooh I second this question. Cliff, can you please let us know why it has been record rainfall in Seattle but the snowpack is average? The snowpack is not "average" or at "100%". It is, in places, near record depth. And for those who don't have time to hit the link, here is a summary: Central Puget Sound Cascades: 130%; Lower Columbia: 167%; Central Columbia 127%; Upper Columbia 145% etc. etc. And that is based on the USDA maps which have not consistently correlated with other independent measurements that reflect significantly deeper snowpack (ski area, highway, and local measurements). The snowpack - in fact up and down the west coast - is well above average this year. There are more stats on this and more links if you are interested. I hope this bodes well for the upcoming fire season, there was one two years ago that had smoke coming into Portland for weeks at one point - it became quite thick and made daily living conditions fairly awful for those with circulation and breathing issues. @ Dooh - The winter has been cooler and wetter than usual, but in many places, the snow fall is not a similar percentile ranking high because the cool and the wet have tended to trade off. We've gotten a lot of early and later winter weather cool enough to bring down the average temperature, but not cold enough for snow. Meanwhile, during December and January, when cooler than average basically guarantees snow in the mountains, we had average, or even slightly below average precipitation. 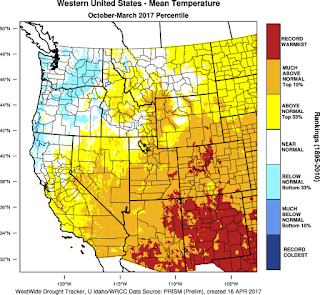 This pattern has been punctuated by a couple tropical atmospheric rivers that dumped warm rain all over the region, reducing snow pack, but not lasting long enough to significantly alter the season's average temperatures. And as sunsnow pointed out, despite that, most areas are above, and some areas well above the average snowpack. Buddy are you implying that if you remember bad weather from the 20th century you're an old timer? This old-timer at 46 remembers the winter of 88/89 as particularly miserable but my folks compared every winter to the winter of 69 (just before I was born). Not to say I wasn't happy to be west of the cascades this winter. The snow did look kind of "fun" which shows you how long I've lived on the mossy side. Perhaps my mind is slipping in my old age. Why aren't my seeds growing?